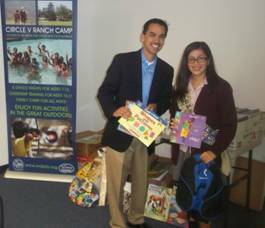 Circle V Ranch Camp & Retreat Center Director Ray Lopez gratefully accepts the donation of 2,112 children’s books along with 453 items of arts & craft supplies from 16-year-old Isabella Virgen, member of the Girl Scouts of Greater Los Angeles Troup 581 from San Marino. Isabella worked with Saints Felicitas & Perpetua School and Parish in San Marino to collect books and host a bake sale. She also assisted a second grade Girl Scout troop at the school in earning their painting badges. She requested they donate art supplies to help with her project. Isabella also requested help from a non-profit organization called Swirls for Girls to donate arts & crafts supplies such as construction paper, markers, crayons, chalk, glue sticks, paint & brushes and more. As a result of her efforts, Isabella has earned (and will receive at a ceremony in June) the 2012 Girl Scout Gold Award, the highest honor given in Girl Scouts since 1916–to inspire girls to find the greatness inside themselves, share their ideas and passions and undertake projects that improve their communities. Founded by the Society of St. Vincent de Paul Los Angeles Council in 1945, Circle V Ranch Camp & Retreat Center has been located on 30 acres in the Los Padres National Forest in Santa Barbara County’s Santa Ynez Valley near Cachuma Lake since 1990. There are eight Circle V Ranch Camp summer sessions, each six days and five nights of traditional supervised fun for boys and girls ages 7 to 13. Campers enjoy activities including hiking, swimming in the pool, learning about nature, archery, arts and crafts, painting, photography, playing games of baseball, basketball, ping pong, foosball, soccer, miniature golf and of course, campfires, skits and songs. (There is no TV, radio or internet access to affect the experience.) Campers stay in air-conditioned cabins or traditional canvas tents. Three nutritious daily meals served family-style in the Dining Lodge offer not only food but also more camaraderie and fellowship. In 2012, the camp hosted more than 1,200 children for this time-honored summer experience. During autumn, winter and spring, the Camp & Retreat Center is available for rental to other non-profit groups and organizations. For more information on Circle V or to become involved in the volunteer Friends of Circle V, please contact Camp Director Ray Lopez at (805) 688-5252 orrlopez@svdpla.org. For complete information, visit the Camp’s new website www.circlevaranchcamp.org.